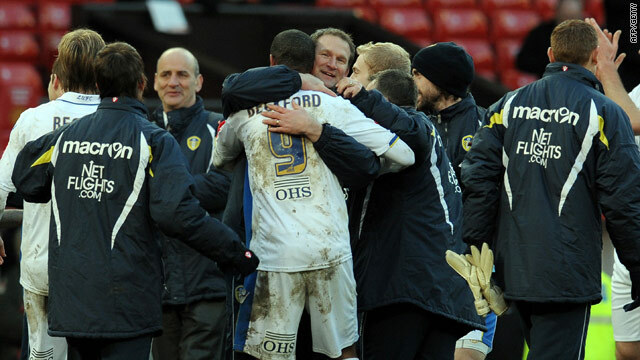 Leeds goalscorer Jermaine Beckford celebrates with manager Simon Grayson after their shock 1-0 FA Cup win over Manchester United. (CNN) -- Manchester United were sensationally knocked out of the FA Cup as they lost 1-0 at Old Trafford to third-flight underdogs Leeds United. A goal after 18 minutes from Leeds striker Jermaine Beckford sent the English Premier League champions crashing out in the third round to end their hopes of a sweep of major trophies this season. It was the first time that United had gone out at this stage since 1984, but Leeds, who are leading League One, deserved their victory despite withstanding late pressure. United manager Alex Ferguson was furious with his team's display and hinted he would make wholesale changes for their English League Cup semifinal first leg against neighbors Manchester City in midweek. "I am shocked by the performance because our preparation for the game was very good," he told his club's in-house television station MUTV. "But we never got going. The quality of the passing and whole performance was bad." Ferguson said the visitors fully deserved their victory, having started 11-1 outsiders with some bookmakers to win. "Leeds had far bigger appetite than us," he admitted. Beckford, who is a target for a number of leading clubs, took advantage of defensive indecision to latch on to a long ball from Jonny Howson and hold off Wes Brown before beating Tomasz Kuszczak from an acute angle. Wayne Rooney had United's best chance of the first half, but after the break they struggled to break down Leeds with Alex Ferguson bringing on Michael Owen, Antonio Valencia and Ryan Giggs in a desperate attempt to spark his attack. Owen should have scored almost as soon as he arrived, but he scuffed his shot with Dimitar Berbatov also wasting a chance in the same move. Beckford might have finished off United for good as he shot narrowly wide and Robert Snodgrass came even closer shortly afterwards when his free-kick rattled against the woodwork with Kuszczak beaten. Owen had penalty appeals waved away, Rooney shot over and Fabio nearly converted in a goalmouth scramble, but Leeds held on to send their 9,000 traveling fans into a frenzy. Leeds began the last decade at the top of the Premier League and challenging in Europe until a financial meltdown saw them slip down the divisions, but the current side under manager Simon Grayson are restoring pride to a once great club who were winning at Old Trafford for the first time since 1981. They were later paired with eight-time FA Cup winners and Premier League high-flyers Tottenham Hotspur in the draw for the fourth round. Meanwhile, Premier League leaders Chelsea avoided an upset with a 5-0 thrashing of second-flight Watford at Stamford Bridge. Daniel Sturridge, who is getting his chance in the Chelsea attack with the likes of Didier Drogba on Africa Cup of Nations duty, scored twice with captain Frank Lampard also on target in the rout. Arsenal were given a fright at West Ham as they fell behind to Alessandro Diamanti's first half strike and might have been further adrift as they struggled to get into the match. But a largely second-string line-up found their form after the break and deservedly equalized in the 78th minute as man-of-the-match Aaron Ramsey beat Robert Green with a low shot. Croatian international Eduardo quickly scored the winner with a clever header which saw Green grasping at thin air.